I have decided to re-create some of the parts that are no longer available. This began out of necessity for the restoration of my own car. However, due to the level of interest, I've decided to offer them to fellow America owners. Some of these parts are items I've had made, made myself, or have located and modified to be and fit as original as possible. If you would like any of these items, or have found a part that you would like me to reproduce, please contact me. 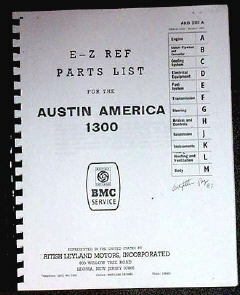 Reproduction Dealer Parts Book. This is about 50 double-sided pages with great technical drawings of many assemblies, along with all the factory part numbers. Dated 1969. It will come spiral bound as seen with a protective clear cover and thick cover stock back. This is a support I designed for holding the rear side windows (rear quarter windows) open while driving. It keeps the latches from collapsing and closing the windows. 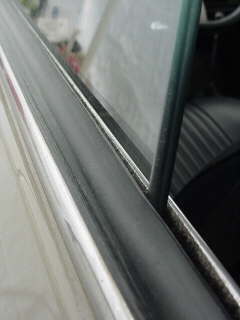 Does not damage the paint, weatherstripping, window. Installs or removes in seconds. Will not fall out. This is a must have if you live in hot weather! Sold in pairs. 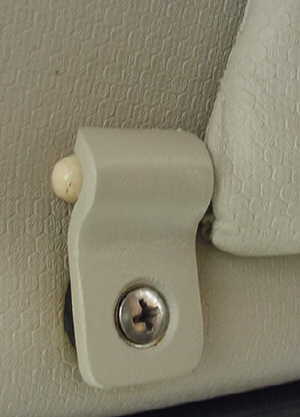 Reproduction Sunvisor clip. Available in a textured powdercoating. No drilling or other body modifications required. Stainless screw and washer, and mounting piece supplied. This carpeting is very close to the original in color and texture. Easy to install and looks excellent when combined with some thick 5/8" Jute sound deadener/padding. Reproduction door interior glass seal. This "fuzzy" and cloth covered seal is installed the same way as the outer door seal. It takes about 15min. and does not require any disassembly of the door. Replica tail light lens & housing gaskets. Cut using the original dies and made of the original natural closed cell foam. 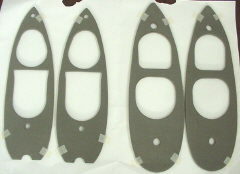 Other light gaskets available. For more information please contact the 1100 Club in the UK who have purchased the dies. 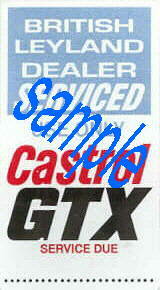 Replica British Leyland dealer service decals. Beautiful and crisp artwork on vinyl. They can be written on, just like the originals and are safe to apply to the painted surfaces of the car, like under hood, or slam panel. There is no paper decal type backing, so no sticky residue will be left behind once peeled off. Reproduction side trim logos. Exact replacements and fit on directly over your existing faded aluminum logos. 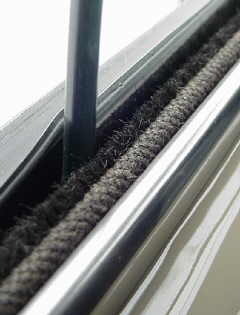 Reproduction door glass squeegy, also called the "Door Waste Rail Seal." These are simple to replace and can be done without taking the door completely apart, or damaging the exterior paint. It takes about 15-20min. to install one. 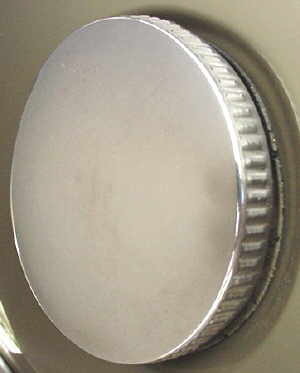 Reproduction gas cap for the 1970 and 1971 models only that have the larger diameter fuel filler neck with the fuel vapor/overflow canister attached inside the trunk. This cap is a larger diameter cap than that used on the '68/'69 cars or other models that didn't have the 'emissions control fuel vapor recovery' systems. This cap is polished stainless steel to look like chrome. It will not rust. 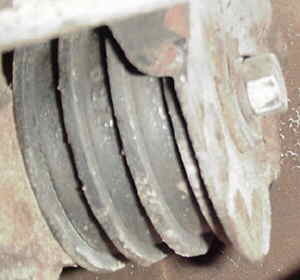 Reproduction "blocks" for holding the hinge tabs at the front edge of the rear quarter windows. These are molded in black urethane and have a slightly shiny appearance similar to tires that have a fresh coat of tire dressing. The urethane makes these indestructable, yet still soft so the windows are held securely and open properly. Reproduction VIN plate with stainless screws provided. High quality viton valve stem seals are available for all A Series and A+ Series engines. These seals fit with both single and dual valve springs and can be installed with the cylinder head on the car. They eliminate the smoking on start up, the smoking after sitting at a traffic light, smoking after a long deceleration, and oil consumption. Email me for price and details. More info is in the Technical Advice: Engine page. Reproduction "Domed" battery cables. 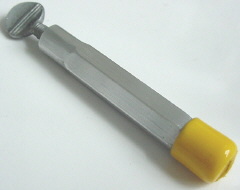 The ends are stamped with "+" and "-". Both are made with No. 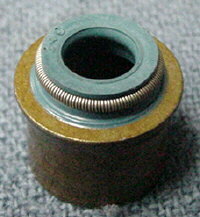 2 gauge cable with eyelet style ends as shown. Reproduction mount for the rear of the remote shift housing. This mount is stronger and stiffer than the original mount, so there is less movement of the entire engine and transmission, and less wear & tear on the rest of the motor mounts. 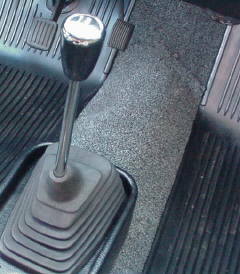 There is also noticeably less vibration related movement in the shift lever.